The Voltage Standing Wave Ratio (VSWR) is less than 2:1. All electrical connections are secure and free of corrosion. The antenna cable shows no wear or damage. 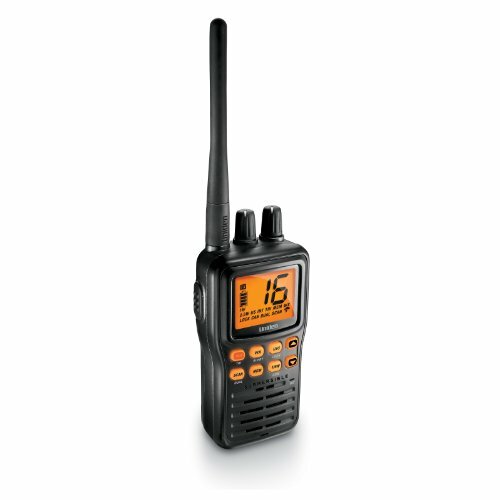 You can use the BC75XLT to monitor police and fire departments (including rescue and paramedics), NOAA weather transmissions, business/industrial radio, utilities, marine and amateur (ham radio) bands, and air band transmissions. 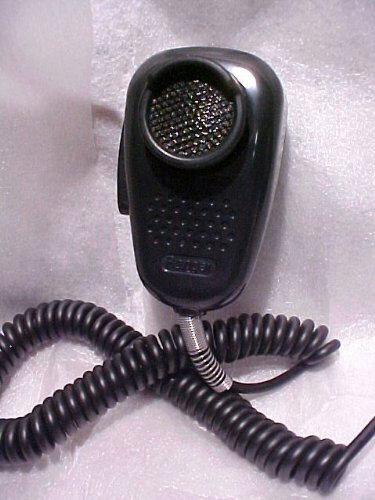 Of course, scanning the 32,000 available frequencies can be time-consuming and frustrating, which is why Uniden added such functions as Close Call capture technology, which instantly tunes to signals from nearby transmitters to help you detect and identify local signals, and a comprehensive memory that holds up to 300 programmed channels. 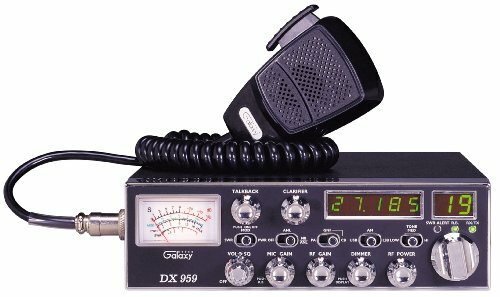 Receives conventional channels on the following frequencies: (25-54 MHz) (108 - 174 MHz) (406 - 512 MHz) To program the unit: Push Hold. This should bring up the first available channel, it should show B:1 Channel 1 and 000.000. To program your frequency in you will push in the Orange Function key and then let go. Immediately push in the E button and let go. You will then see a black box with PGM in it in the top right corner of screen, this means you are in program mode. Type in your frequency including the decimal point, when finished push in the E key and let go. This will enter in the frequency. To enter in another frequency turn the knob at the top right one click to the right and this will bring you to the next available channel. Follow step 5 and on. When finished entering in all of your frequencies you may hit scan. The scanner will now begin scanning your frequencies. 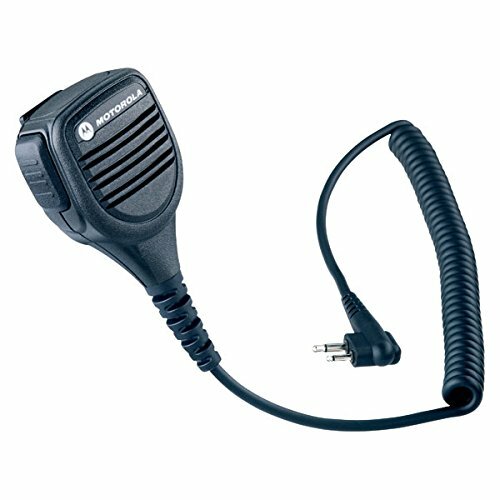 Having a CB radio while traveling can be an invaluable tool for emergencies and for keeping up on road conditions, and the Midland 75-820 40-channel handheld CB is one you should definitely consider. It comes with everything you need to get started in a hurry, including a battery pack for times you want to run the unit on six AA batteries and a cigarette lighter adapter for battery-free operation in your car. An invaluable tool for emergencies and for keeping up on road conditions. Power with six AA batteries or your vehicle's power port. Compatible with Midland headsets such as the 22-540. 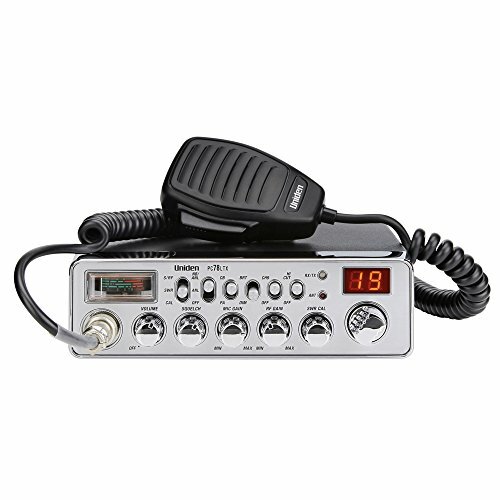 Ultra-Portable CB and Weather Radio 40-Channel CB Radio The 75-822 offers 40 separate communication channels, delivering the maximum CB communication range with 4 watts of output power. Channel scan can automatically check all channels for activity, stopping on any active channel for five seconds. You can also store and instantly access up to five of your favorite channels in memory. When you flip on the device, a last channel memory feature will turn on the last channel you selected before powering off. While communicating, a built in ANL (automatic noise limiter) improves reception for weak signals, and squelch control further eliminates background noise. Weather Radio/Emergency Channel Convenience The 75-822 features instant access to NOAA Weather Radio, for weather/hazard information in your area 24/7. Immediate access to emergency channel 9 and informational channel 19 is also provided. The Dual Watch feature lets you monitor channel 9 and another channel of your choice simultaneously. Power With AA Batteries or Vehicle Power Port You can power this unit with six AA batteries, complete with a battery life extender feature. To get even more from your batteries, high/low transmit power settings are provided (4 watts and 1 watt, respectively). A mobile adapter is also included for powering directly from your vehicle's "cigarette lighter" power port. Easy to Use The 75-822 boasts a large, backlit multifucntion LCD display that's easy to read, day or night. A keypad lock feature "locks in" your preferred settings, so they aren't accidentally changed. The flexible antenna with BNC connector is easily removed for transport, and an external headset jack is provided for hands-free use. The Eilimy G319 is an effective signal detector that helps you detect various sources around you and detect various error signal transmission devices such as hidden cameras and GPS trackers through signal fluctuations. Ultra-high sensitivity, strong anti-interference ability, wide detection range, and effectively protect your privacy. Can be used in offices, important business negotiations, confidential meetings, homes, bathrooms, cars, hotels, locker rooms, etc. There is a need to prevent a variety of environments that are subject to monitoring, eavesdropping and interception. Privacy is one of our growing concerns. The small and sensitive Eilimy wireless signal detector is your best choice! Easy to use, small and portable.The detector is an upgraded version of the old G318. The new G319 is equipped with a more powerful built-in battery to improve working standby time, a new upgraded advanced chip manufacturing technology, a new look, beautiful and optimized button feel, product cooling performance, and more powerful quality. Our products have the highest performance ratios in their class of detectors, unlike plastics and inferior detectors that are unstable or ineffective. The Eilimy signal detector has the same and stable function as the high price detector. The important thing is that we promise the best price and it is your best choice! Products include full-range detectors, antennas, a power adapter and USB cable, built-in lithium polymer battery, fully charged for 15-25 hours of normal use. The closer the signal detector is to the signal source, the faster the alarm sounds. At this time, the sensitivity can be adjusted to lock the signal emission position to find the hidden device. Please Read The Description And Check The Pictures. Used In Good To Very Good Perfectly Working Condition. This compact, well built, rugged handheld Marine radio is rated JIS8/IPX8 submersible and is packed with outstanding features. Included accessories are a rapid clip-on DC charger, and Lithium-Ion rechargeable battery. This compact, well built, rugged handheld Marine radio is rated JIS8/IPX8 submersible and is packed with outstanding features. Rapid clip-on DC charger works in any standard 12 volt DC "cigarette lighter" style outlet. All USA, International, and Canada Channels The MHS75 covers all USA, International, and Canadian marine channels, keeping you up-to-date with all the latest marine activity. All NOAA Weather Channels with Weather Alert This radio comes preprogrammed with NOAA weather channels. The Emergency/Weather Alert allows it to function as a severe weather warning radio and will also alert you to any local or national emergencies. If the NOAA issues warning while this feature is turned On, the radio sounds an alert tone. You will then hear the emergency/weather broadcast. Instant Channel 16/9/Triple Watch Triple Watch mode monitors channels 16 and 9 for a signal while you listen to the currently selected channel. 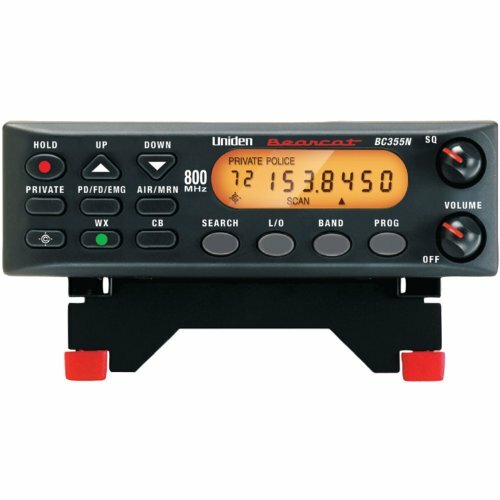 The marine radio checks channel 16 and 9 for activity every 2 seconds. Dual, Triple, Quad Watch Operation These different watch modes let you monitor up to two Coast Guard Distress/Hailing channels and one weather channel along with one regular marine channel. Memory Channel Scan Automatically scan your programmed channels with Memory Channel Scan. Scanning starts from the lowest to highest channel and stops when it finds an active channel. It remains on that channel until the transmission ends, then resumes scanning after a two-second delay period. Clip-On DC Charger The MHS75 ships with a rapid clip-on DC charger. Charge in any standard 12 volt DC "cigarette lighter" style outlet. JIS8 Waterproof Level Uniden MHS75 VHF Hand Held Radio won't give up no matter how wet it gets. Whitecap splash, gusty spray, tidal wave, whatever, this radio can take it. 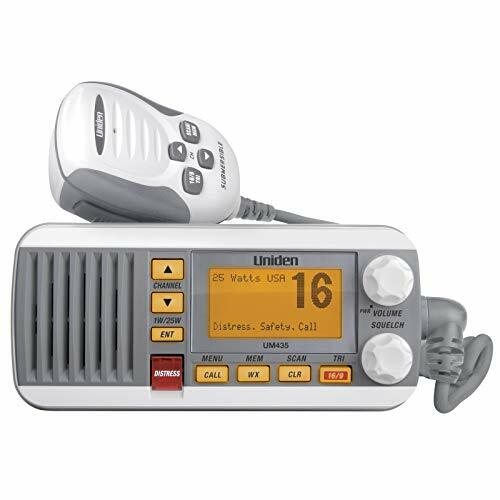 The Uniden MHS75 2-way Marine Radio is built rugged to take the rigors of being out on the water, day in and day out with a full JIS8 waterproof rating. It also features a floating design, and is submersible for up to 30 minutes at five feet. Easy Viewing The MHS75's large, easy-to-read backlit LCD display and backlit keypad make it easy to use, day or night. Three-Year Warranty The MHS75 is backed by a three-year warranty. The G318+ Signal Detector is the latest upgraded signal detection device in 2018. As its name suggests, it is an upgraded version of the G318 detector currently on the market (the same price, higher performance ratio). It can help you detect various sources around you and detect various error signal transmission devices such as hidden cameras and GPS trackers through signal fluctuations. Ultra-high sensitivity and a wide range of detection to protect your privacy. 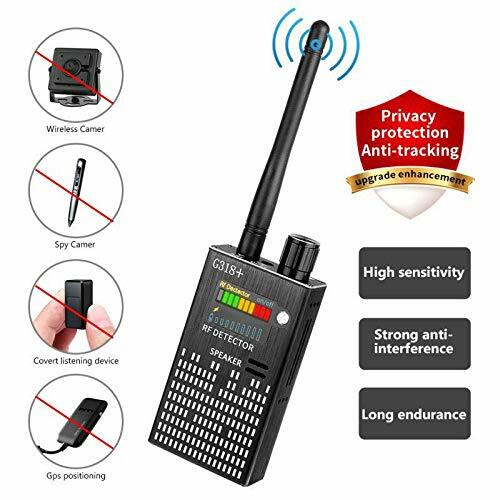 Can be used in offices, important business negotiations, confidential meetings, homes, bathrooms, cars, hotels, locker rooms, etc., need to prevent a variety of monitored, eavesdropping and intercepting environments. Privacy is one of our growing concerns. The small and sensitive portable handheld wireless signal detector is the best choice to protect your privacy! Easy to use, small and portable. The newly upgraded G318+ signal detector is equipped with a more powerful built-in battery to increase standby time. The newly upgraded advanced chip manufacturing technology captures signal sensitivity higher than the older models. The new look, beautiful and optimized button feel, enhanced thermal performance and more powerful quality. Products include full-range detectors, antennas, power adapters and USB cables, built-in lithium polymer batteries, fully charged 15-25 hours of normal use, longer standby time, easy to carry it on the road during business trips or travel. The closer the signal detector is to the source, the faster the alarm will sound. At this point, the sensitivity can be adjusted to lock the signal emission position to find the hidden device. Our products have the highest performance ratios in their class of detectors and are completely different from plastics and inferior detectors that are unstable or ineffective. The CaGuan signal detector has the same and stable function as the high-priced detector. The important thing is that we promise the best price and it is your best choice! 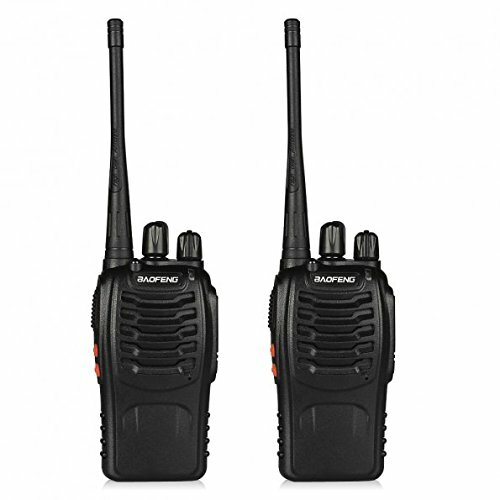 This radio's multiple adjustments allow you to fine tune the signal and sound, for excellent clarity. Change the squelch control settings and the ANL/Noise Blanker option to reduce static and enjoy clear sound. Adjust the microphone gain to control the mic sensitivity. "The BCD436HP is the first scanner to incorporate the HomePatrol-1's ease of use in a traditional handheld scanner. Plus, Uniden's exclusive Close Call RF Capture feature, GPS Connectivity, Extra-Large Display, Radio System Analysis and Discover Modes put the most advanced scanner features ever right in the palm of your hand. The LCD backlit keypad elluminates the keys and screen helps you make favorite lists quick and easy to setup. The department/site Quick Keys makes for a quick call or tagging the system/channel number. There are five different frequencies that are covered with the BCD436HP (25-512 MHz, 758-824 MHz, 849-869 MHz, 894-960 MHz, 1240-1300 MHz). Other features: TrunkTracker V, APCO 25 phase I and phase II, X2-TDMA, CTCSS/DCS rapid decoding, P25 NAC decoding and simple-to-use Sentinel PC software to keep your scanner's database and firmware up to date. Receives conventional and the following types of trunked channels: Motorola Type I Motorola Type II Motorola Type IIi Hybrid Motorola Type II Smartnet Motorola Type II Smartzone Motorola Type II Smartzone Omnilink Motorola Type II VOC LTR Standard Project 25 Standard Motorola X2-TDMA P25 Phase I and Phase II EDACS Standard (Wide) EDACS Narrowband (Narrow) EDACS Networked (Wide/Narrow) EDACS ESK On the following frequencies: (25-512 MHz) (758-960 MHz) (excluding cellular telephone bands) (1.24 1.3 GHz) "
Uniden BC355N 800 MHz 300-Channel Base/Mobile Scanner. Close Call RF Capture Technology. Pre-programmed Service Search. 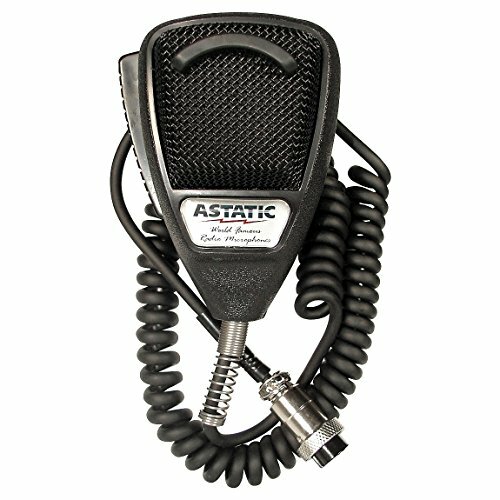 Action Bands to Hear Police, Ambulance, Fire, Amateur Radio, Public Utilities, Weather, and More. "The BC355N is an affordable, basic mobile scanner that's great for home or mobile use, with 300 storable channels, coverage of all the ""action"" bands, convenient features like ""close call"" and program lock, and a wealth of powering options for different applications. Receives conventional channels on the following frequencies: (25-54 MHz) (108-174 MHz) (225-380 MHz) (406-512 MHz) (806-956 MHz) (excluding cellular telephone bands) "
Coverage includes action bands for police, ambulance, fire, amateur radio, etc. View larger Uniden Atlantis 270 The Uniden Atlantis 270 features all NOAA emergency weather channels, as well as all USA, International, and Canadian marine channels. It meets JIS7/IPX7 submersible waterproof standards, and it floats/ The PowerBoost key ensures longer battery life and extra-long range when needed in an emergency. The Atlantis' brilliant backlit LCD display makes it easy to use, day or night, for the power to go anywhere. Waterproof specifications The Atlantis 270 is a submersible radio, complying with floating JIS7/IPX7 water-resistant standards. The radio can be submerged in 1 meter of water for 30 minutes without damage. 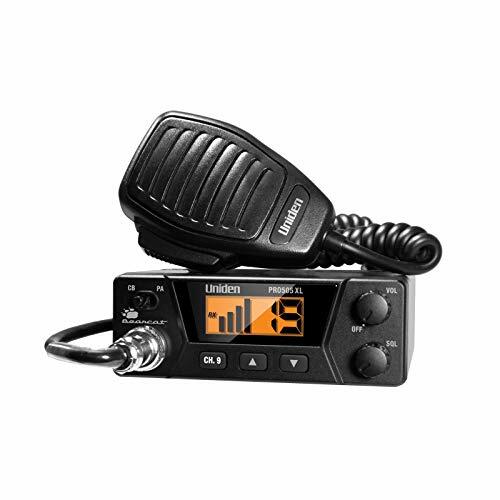 This radio is great when camping, hiking, or rafting. After the radio is submerged in water, the sound may appear distorted from water still remaining in and around the speaker and microphone. Just shake the radio to clear excess water, and the sound should return to normal. If your radio is exposed to salt water, clean it thoroughly with fresh water and dry it before turning it on. The charger is not waterproof. All NOAA Weather Channels with Weather Alert This radio comes pre-programmed with NOAA weather channels. The Emergency/Weather Alert allows it to function as a severe weather warning radio and will also alert you to any local or national emergencies. If the NOAA issues warning while this feature is turned On, the radio sounds an alert tone. You will then hear the emergency/weather broadcast. 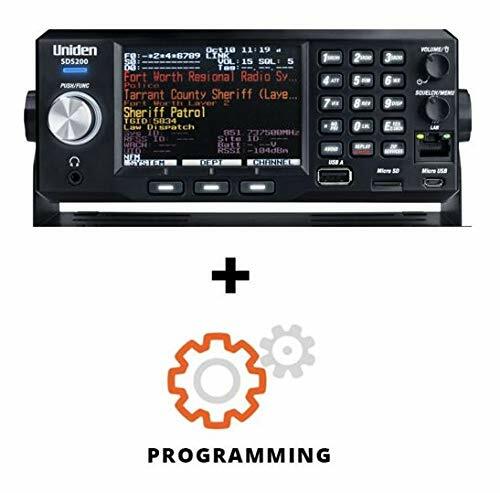 Uniden creates another first with the SDS100 true I/Q scanner, the first scanner to incorporate software defined radio technology to provide incredible digital performance in even the most challenging RF environments. The sds100 s digital performance is better than any other scanner in both simulcast and weak-signal environments. The SDS100 is also the first scanner that allows you to decide what to display, where, and in what color. Custom fields put the information important to you right where you need it. And, one more first, the SDS100 meets JIS4 (IPX4) standards for water resistance. PRIVACY PROTECTION Eilimy Signal Detector is an effective signal detector that helps you detect various signal fluctuations in the surrounding environment and detect and lock various error signal transmission devices such as hidden cameras and GPS trackers through signal fluctuations. . Ultra-high sensitivity and a wide range of detection to protect your privacy. SUITABLE FOR USE Can be used in offices, important business negotiations, confidential meetings, homes, bathrooms, cars, hotels, locker rooms, etc. The various environments that need to be protected are not monitored, eavesdropped and intercepted. Wireless detectors detect the presence of strong radio signal radiation around the living and working environment. Eilimy wireless signal detector is your best choice! EASY TO USE, SMALL AND PORTABLE The signal detector is an upgraded version of the old G318 at the same price. The new G318+ is equipped with a more powerful built-in battery, which can improve working standby time, new upgraded advanced chip manufacturing technology, new appearance, beautiful and optimized button feel, product heat dissipation performance, and more powerful quality. 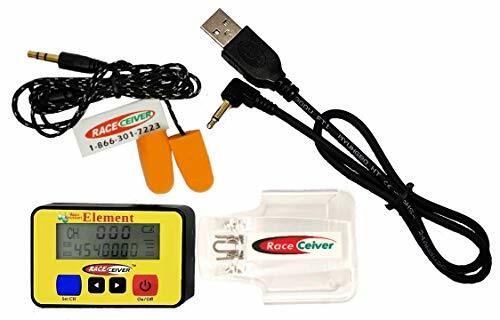 PACKAGING AND USE Products include full-range detectors, signal antennas, power adapters and USB cables, built-in lithium polymer batteries, and fully charged for 15-25 hours. When used, the closer the signal detector is to the source, the faster the alarm will sound. At this point, the sensitivity can be adjusted to lock the signal emission location to find hidden devices. OUR COMMITMENT Our products have the highest performance ratios in their class of detectors and are completely different from plastic and inferior signal detectors that are unstable or ineffective. The Eilimy signal detector has the same and stable function as the high price detector. The important thing is that we promise the best price and it is your best choice! 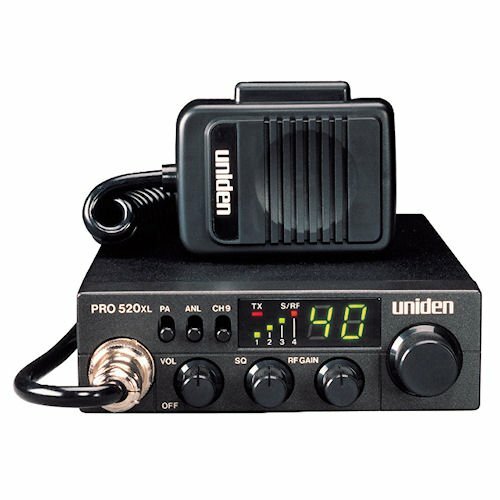 The Uniden SDS200 is a True I/Q TrunkTracker X Base/Mobile Scanner. Uniden SDS200 is a latest and most advanced base/mobile digital trunking scanner. The SDS200 incorporates the latest True I/Q receiver technology, which provides the best digital decode performance in the industry, even in challenging receive environments. Submersible, rugged, reliable-say Hello to the mariner's most faithful companion. Completely submersible design is equipped to handle the weather and the waves, while remaining your fail-proof lifeline to the information and communication that keeps you safe at sea. All USA/international/Canadian Marine channels, including the new 4-digit, and the Canadian B channels. 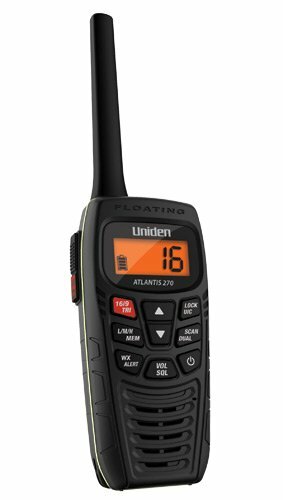 The Uniden Atlantis 275 continues Uniden's tradition of providing tough and reliable handheld radios. It features all NOAA weather channels, as well as all USA, International and Canadian marine channels. It also meets Submersible waterproof standards. The Atlantis's brilliant backlit LCD display makes it easy to use, day or night for the power to go anywhere. Warranty: Most new Uniden products carry a one year manufacturer's warranty from the date of purchase. Please save your receipt for proof of purchase. See your warranty documents included with the product for more details. 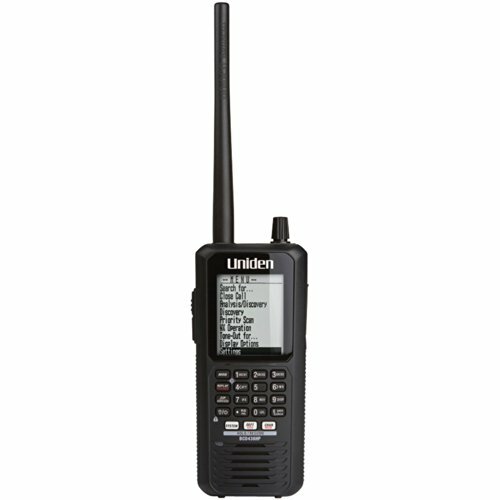 The Uniden Atlantis 155 continues Uniden's tradition of providing tough and reliable handheld radios. It features all NOAA weather channels, as well as all USA, International and Canadian marine channels. It also meets Submersible waterproof standards. The Atlantis's brilliant backlit LCD display makes it easy to use, day or night for the power to go anywhere. 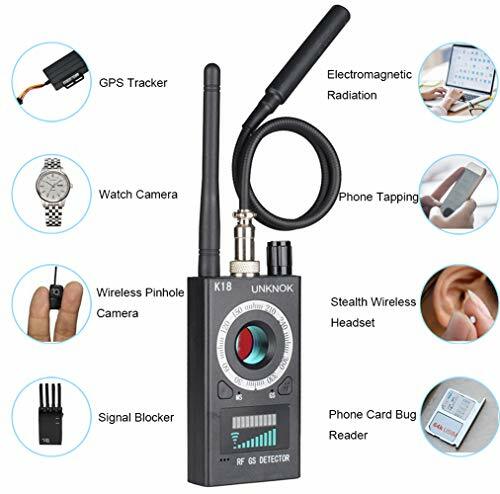 The UNKNOK Professional Wireless Radio Frequency Detector is a low-cost, highly effective bug sweeping device that detects a wide range of illegal spying devices. Adopting more advanced digital receiving mode makes the detection frequency domain wider and greatly improves the anti-interference ability and sensitivity. With powerful signal processing technology, you can adjust the sensitivity to the appropriate level and easily detect suspicious devices around you. This professional detector, which has functions of radio wave detection, magnetic field detection, wired or wireless camera detection, can detects suspicious devices, whether they are in operative mode or in standby state. When a suspicious device is detected automatically, the user will be warned by sound, indicator light or vibration. This product is simple to operate and portable, and protects your privacy and business secrets in the maximum extent. Can accurately identify eavesdropping, telephone tapping and digital eavesdropping, tracking, vehicle eavesdropping, wireless pinhole cameras, wired cameras, electrical sources. 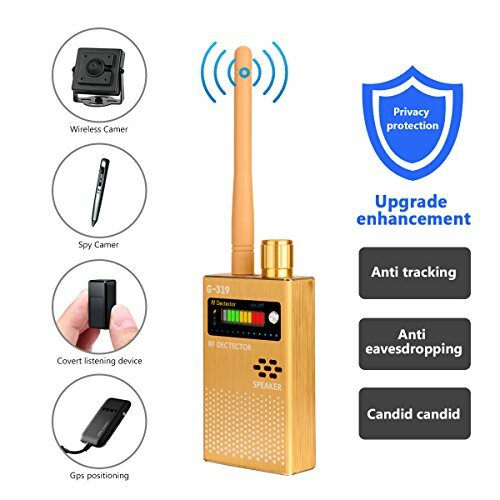 Can detect 1.2G to 5.8G wireless hidden camera equipment, professional radio detection device, high sensitivity, adjustable threshold, large range of frequency detection. LED laser technology can detect the standby state of the wireless or wired camera equipment. Can detect the standby state magnetic locator, bug; Easy to use(only switch + sensitivity knob), sound and light alarm indicator, accurate and reliable. Function Multi function detectable pin hole camera and other detect wireless products. Built in super bright red LED,can find out all monitor camera, pin hole, button and mobile camera etc. Dual mode RF detector detectable, buzzer mode and vibrate mode can also used earphone to detect RF signal, without any sound from unit. Wide Application Detectable RF frequency from 1MHz to 6.5GHz for all FR frequency include GSM, WIFI BT, FM, VHF, UHF, 900 / 1200 / 2400 wireless audio and video transmission frequency. It not only can be used for Hotel, Home, Dressing Room, Bathroom, but also Government office, Confidential Meeting, School Examination. Small size and light weight, it can be handheld conveniently, and can be carried to a variety of occasions. Upgraded Wireless Bug Detector The improved one is easy to operate and portable. Stronger anti-jamming and wider range of detection frequency. This product uses advanced chips and has modes of laser scanning, RF wireless signal detection, magnetic field signal detection and so on. The back of the detector is equipped with six high-brightness laser lights, which can assist in finding micro pinhole lens and prevent omission. High Sensitivity Through adjusting The Potentiometer, it can increase/decrease the sensitivity and expand/reduce the detection range. Camera detector can quickly identify the source signal waves with equipped strong signal indicator light. Warranty 12 months warranty with 24-hour response service is friendly offered. No risk purchase guarantee is for every customer's smiles.Warranty Small size and light weight, it can be handheld conveniently, and can be carried to a variety of occasions. 12 months warranty with 24-hour response service is friendly offered. No risk purchase guarantee is for every customer's smiles. 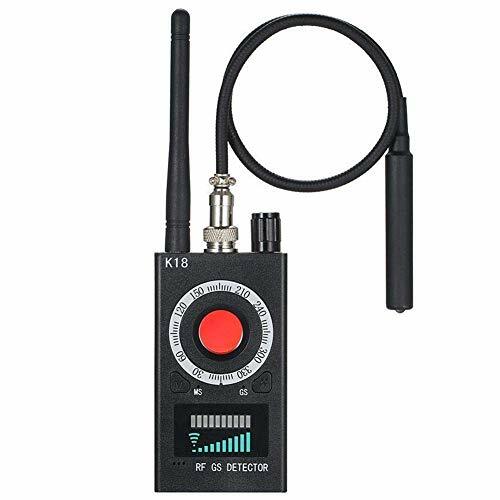 This Radio Scanner is an effective signal detector that helps you detect various sources around you and detect various error signal transmission devices such as hidden cameras and GPS trackers through signal fluctuations. Ultra-high sensitivity, strong anti-interference ability, wide detection range, and effectively protect your privacy. Can be used in offices, important business negotiations, confidential meetings, homes, bathrooms, cars, hotels, locker rooms, etc. There is a need to prevent a variety of environments that are subject to monitoring, eavesdropping and interception. Privacy is one of our growing concerns. The small and sensitive wireless signal detector is your best choice!